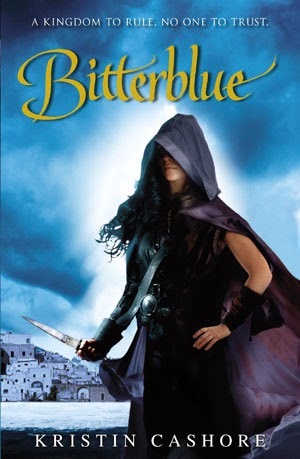 Over the holidays I've been thinking of my favorite books that I would recommend under any circumstances, and one book that makes the list without question is Bitterblue, which I realize I haven't actually reviewed here on Fantasy Book Critic. So I'm addressing that oversight immediately. I love absolutely everything about this book. It's the third in a series, and you do need to read the first two to get the most out of the third. It's not a hardship: I enjoyed each, but while Bitterblue is in the same series, it is not at all the same kind of book. It blew me away. 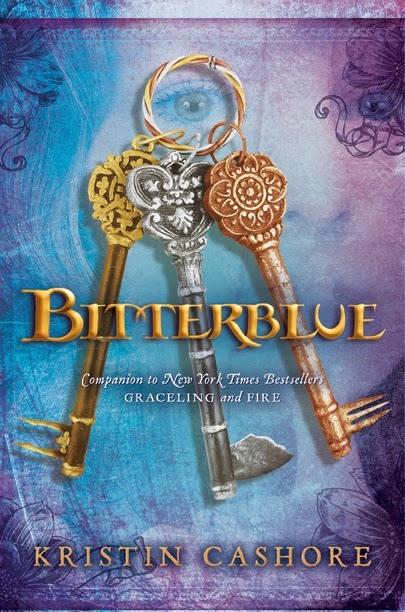 Bitterblue is the third (and final, I think) installment in Kristin Cashore's Graceling series. While I love this world, I'm fine with this book being the last of it, because Cashore has wrapped up the necessary loose ends. The first is Graceling, and the second is Fire. Chronologically, Fire takes placed earliest, followed by Graceling, and Bitterblue is set eight years after the events of Graceling. If you haven't read the previous two, characters from previous books do appear in Bitterblue, but everyone's relevant background is covered. I don't mean to discourage anyone from reading the previous books, because Cashore does some really interesting things with them. But while I thought Graceling was interesting and Fire even more so, Bitterblue completely blew me away. Many people haven't appreciated the pacing. Bitterblue isn't exactly fast-paced, nor is it terribly linear, and those are what we are trained to expect. Our protagonist has a problem, our protagonist is overwhelmed by said problem, our protagonist decides to tackle said problem, other forces get in the way, and our protagonist overcomes everything and triumphs. For a while, Bitterblue isn't even sure that there is a problem, or what the nature of the problem is, and it keeps changing on her. She doesn't know that she's supposed to deal with the problem, and then if she is, what she can possibly do? Unlike previous books, her unique magic can't be part of the solution, because she doesn't have any magic. So, no, the book is not linear. Problems close around Bitterblue from all sides, and when she thinks she has a handle on one, something else complicates it, and she is struggling to process conflicting information from all around her and trying desperately to save her people. And I love this, because I think the pacing of the book reflects Bitterblue's mental and emotional state—and life. Bitterblue's problems and goals are abstract, and so her approach is also abstract. There also isn't really an antagonist in Bitterblue, because [BRIEF SPOILER ALERT] the source of all the problems was Leck, but he's been dead since Graceling. Life would be simpler if there was a single villain at the source of all our problems and defeating said villain would magically make everything better, but the problems remain, and the victims, and somehow people have to deal when there is no one to defeat or take the blame. Despite the inherent narrative difficulties, Bitterblue does triumph, and the end isn't just satisfying, it's uplifting. In many ways, Bitterblue is about dealing with grief — politically, socially, economically, personally — and there is no simple answer for that. So, some people were bothered by the pacing, but I don't think this book would work with any other kind, and for me, it really worked. Some readers felt Cashore dwelled too much on the ciphers. I loved the ciphers. They were fascinating, accessibly explained, and they were incredibly tied into the plot, the world, the themes, and Bitterblue, because Bitterblue is also about secrets. And language: I love that a character is attempting to write the first dictionary, and that we see the introduction of the very concept of a different language. Some people were bothered by the romantic endings in all of the Graceling books, but I appreciate that Cashore hasn't been pressured into having her heroines follow more traditional understandings of what “happily ever after” means: namely, that it must entail marriage and children. I'm really surprised by how many people seem to be bothered by the heroines' choices — or what they perceive to be Cashore's heavy-handed authorial intervention — because the heroines have very good and well-explained reasons for their choices, and they nevertheless find love and happiness. I love how Cashore deals with issues of what it means to be queen, for Bitterblue's understanding of the world and her place and relationships within it, and we understand exactly how hard it is. Bitterblue's strengths as a character, and as a queen, are her compassion and wisdom, and that's unusual enough in a protagonist to pull me in, but her slog through the problems raised through the book is what makes me love her. I could keep talking about individual pieces that made everything work, but what really struck me was the organic cohesiveness of this book, that everything was inseparably intertwined and emerged organically. I'm not sure what else to say. I think Bitterblue was absolutely gorgeous. I read somewhere that this series will have five books (or more). I agree; I love this series, and Bitterblue comes as an unexpected, but surprisingly real main character. While Katsa makes a great main character in Graceling, she is a superstar, and we have to look up to her rather than commiserating with her. Bitterblue's problems, on the other hand, are foggy, much like our own problems much of the time. Thanks for the review!